SPCR • View topic - Apex MI-008: A Cheap Quiet mini-ITX Case? I was referring to the 45nm stock HSF being lower profile than the 65nm HSF. Are you saying you are going to try the chip or the retail HSF? I have trouble believing the latter will even fit . . .
From experience the Intel stock low profile HSF that comes with the Celeron 440 and Dual Core E5200 will fit inside a case with 60mm interior space with about 3mm to spare (e.g. Casetronic 2699), and will definitely not fit in a case with 50mm interior space (e.g. Silverstone ML02/LC19). According to the SPRC review, the clearance between the PSU and the bottom of the case is 50mm, so the Intel low profile HSF will not fit. Post subject: PS used elsewhere? It seems to me that one of the real eye-openers of this review is the silence of the Allied AL-8250SFX 250W PS used in the Apex case. Does anyone know if Apex uses this PS in any of their other cases - perhaps ones with a bit more clearance for more powerful mb's and heatsinks? , suggests that this is the PS used in most HP/eMachines microATX systems? Absolutely no, no. I'm trying this one exhausting toward the side-mounted 120mm fan. All else fails I'll undervolt it as far as is prudent. I've built three boxes now with the Apex MI-100 case http://www.newegg.com/Product/Product.a ... 6811154084 which is almost identical to this case. I figured out the 120mm fan trick early on - I think a NewEgg product review mentioned it. I used the D945GCLF2 and of course hated that 40mm hair dryer fan on the chipset. I'm using my little boxes for NAS, Windows 2003 server and Linux server for my home network, so they don't get loaded real heavily for the most part. I found that in my application I could just unplug the chipset fan without any apparent consequences. The airflow from the orange 120mm Yate Loon fan http://www.svc.com/d12sl-12-or.html wedged in the side blows directly toward the chipset heatsink, which is apparently enough airflow to prevent meltdown. But I wanted to find a more efficient chipset cooler. The first thing that I tried was a Zalman ZM-NBF 47 http://www.newegg.com/Product/Product.a ... 6835118014. Bad choice. The spring clip attachments face the wrong direction and a couple of the fins interfere with the RAM. After bending some fins and cobbling together clips that would hold it down, I got it in place and working. But that was far from an ideal solution, so I kept looking. The next thing I tried was a SilenX IXN-40C http://www.newegg.com/Product/Product.a ... 6835226019. A lot more expensive, but hey, the clips face the right direct and it fits with the stock power supply. Thus far the SilenX is the best solution I have found. Installation is painless and I am thinking that heat dissipation should be very good since it's full copper. I haven't stress tested it, but it has been stable even with the 120mm fan undervolted by way of a Zalman FanMate 2 http://www.svc.com/zm-fanmate2-75.html. the geek in me really wants to try this for a WHS build....but there's a voice inside my head that keeps saying that if I don't get the HP Media Server, I will regret it. Is the voice in your head sponsored by HP? If so, do you see a cut of that? Anyway. I'd think it would be the opposite. You might be perfectly satisfied by the HP, but wouldn't you always regret that you never had the fun of DIY? Has anyone found a good UK retailer for this yet? It's going to be really expensive here, until the Pound picks up. x2 for SilenX IXN-40C. i am usually not a big fun of SilentX products but this one is actually pretty good - good cooling ability in a small package. I clicked off some quick snapshots of my Server 2003 build and stuck them on Flickr. See http://www.flickr.com/photos/[email protected] ... 138962843/ to see how the SilenX heatsink fits in the case. be mighty interesting to see someone put the psu down low, in front and use a real HS..looks like tons of wasted space under the intended hdd location. and it would leave room for a nice exhaust out the old psu hole. or did i miss that suggestion already...? 1. the Dynatron side-exhausting is a resounding failure- ridiculously noisy on startup, gets quieter, but has the most unpleasant grinding sound known to man. Simple mounting mechanism is offset by horrendous temps: 58-74c-- yes this is a good mount with MX-2.Update: I remounted with MX-2. I was mistaken earlier-- I had used the stock thermal goop. Don't use the stock thermal goop. Temps are 51-71c now (Intel CPU Burn-In), and the CPU fan ramps only slightly. 2. 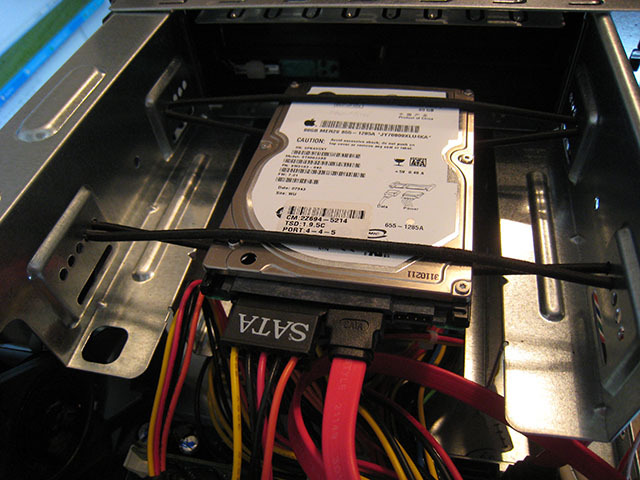 There is no easy way to soft-mount a 3.25" drive permanently with a DVD drive installed. I thought about putting it on the floor resting on foam, but the mobo gets in the way. 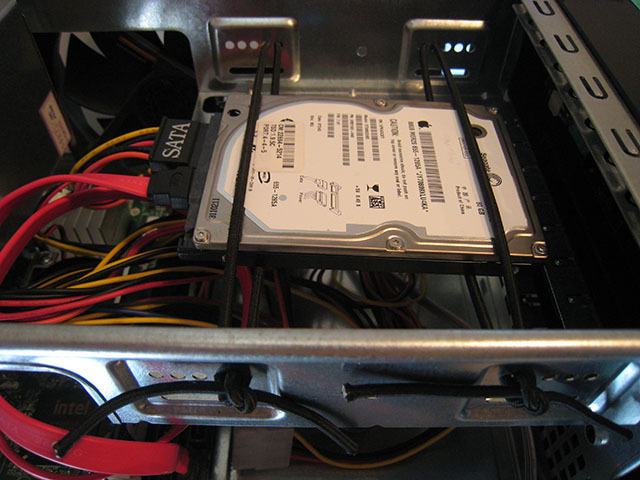 Quiet HDD in this enclosure pretty much means using a notebook drive suspended. 3. PSU ramps less and the case temp is lower (5-9c) with the 120mm fan pushing air through the gap between the DIMMs and past the chipset sink. Noise level for intake is significantly higher than with the fan reversed to exhaust, even at 5v. 4. Future revisions should include door mount for a slim 120mm fan and more open grill work. This could be a very, very nicely ventilated case with a bottom intake vent, as well. If anyone has a suggestion for a nice, quiet low-profile side-vent heatsink, please let me know. There is a significant airflow short-circuit in the empty area next to that used by the 120mm fan as installed by SPCR. Covering that open area (I used some scrap PaxMate) so that only the 120mm fan is open reduces noise and improves board + CPU temps noticeably. It also reduces PSU ramping which, in this particular sample, is remarkably unobtrusive as-is. FWIW, I've found using the single expansion slot as an intake works best to keep board + CPU temps low and block noise pathways. Leaving the other side open as well provides a nice intake at idle and exhaust at load (depending on CPU fan speed). The green power LED behind the power switch can be removed and inserted into a socket conveniently located on the piece of clear plastic on the right side of the case that transmits light. So you can get you power light on the right side. But that's not the cool mod I have in mind. With the power LED removed from its original socket, you could put in its place an IR receiver sensor. So if you have an external or internal USB IR reciever, you can extend the IR sensor (typically about the same size as an 1/4" diameter LED) and fit it behind the power switch. Of course this project will require some soldering work. I just finished this mod and turned an external USB IR receiver into an internal unit. It involved some soldering to extend the IR receiver module (that's the 3-pin device with dome shaped lens) and the status LED (a total of 4 wires - Vcc, Gnd, IR module signal out, and LED out), enlarging the hole behind the power button, and fitting the combined IR module and LED inside the power button. There's plenty of space inside the power switch to house both the IR receiver module (similar to this) and a small LED. To my surprise the small areas of clear plastic on the face of and around the the power button are sufficient to provide excellent IR reception. The best part of the mod was that it did not involve making any external cosmetic modifications to the case. If I am not concerned about having a CD/DVD in that bay, what is the possibility of getting 3 or possibly 4 SATA HDDs in this box? Do I have enough power and cables? The fans are fighting against each other for air. The chipset fan orientation should be changed to blow upwards. If a case fan is added, then it should blow inwards. can't the Apex PSU be opened up and the fan turned around so that it blows out? what would be the harm in doing that? anybody know? Yes, the fan can be easily flipped around so that it blows towards the CPU cooler. (And as always the reminder: "When you break the seal on the PSU case your warranty has ended.") The air will be heated up a few degrees passing through the power supply. Depending on the CPU and heat sink, you probably won't need the tiny noisy fan on the CPU. My Quiet System: Antec P180 spcr_edition, Antec Phantom 500, ASUS P5WDG2 WS PRO, Pentium Dual Core E2220, Scythe NINJA, Sapphire HD 3850, 2 of WD RE 500 MB. Last edited by Broadleaf on Sat Jun 06, 2009 9:31 am, edited 2 times in total. I have this case. Oooo does it make noise while recording to an HDD. But forget that. For the NB I used a the Enzotech CNB-R1 Rev A $20 CND comes with Artic Silver Paste. The clip is reversed, so I used the stock Intel clip, bent a wack load of pins, but bent them back after the install to paintstaking precision to fit the Scythe Mini Kaze HTPC Silent Mini Fan 40MM 3500RPM 4.1CFM 14DBA (just incase it gets too hot in the summer, no a/c here). The Enzotech is good enough to run passive. I might get another for the CPU for shits n giggles. I'm putting my PWM-200 in soon. The OS drive is just a 133x 8GB CF $25 card on an IDE adapter. I was thinking of pairing this case up with the Zotac IONITX-A-U. Since this motherboard comes with an external PSU, I would not have to use the case's PSU. So I was thinking of covering the leftover hole from the PSU with something but not sure with what. Any ideas? For drive mounting, I've been using 1/8" shock cord (from REI) to support the drives. I haven't decided how I'm going to hang a pair for ZRAID, but this works nicely for me. I'm using Scythe MiniKaze 40x40x10 from Petra's Tech Shop to replace the heatsink fan. It makes a huge difference for under $5. I'm frustrated by the noise from the 120mm fan on the side with the case on. Its great with it off, but as soon as the grille is in place, you get a significant increase in noise. These cases don't really support even the D945GCLF2 without a case fan of some sort. The temps under load just get to high. * (FSP) Pico PS significant more efficient, especially at lower powers. * POV MB330 ION-ATOM with 2 Gbye memory combined with a pico PS consumes < 20 Watt idle !!!!!. The POV MB330 ION-ATOM (cost around 120 euro) makes it possible to build a small/compact, low priced, low power ( < 20W !!! idle with pico PSU ) system with PCI express x16 functionality. Last edited by rossewij on Tue Dec 22, 2009 4:06 am, edited 7 times in total. Post subject: cooling a C2D? Did anyone ever figure out how to effectively, and silently, cool a C2D in one of these cases? Combined with an e6300 CPU, and a 30 GB SSD, it could be a small, snappy and quiet system if the CPU could be cooled. Any success stories out there? be warned, these case have just been released in Australia. There is good news and bad news. Good news, no need to worry about the chipset fan. Bad news is that is because the PSU drowns it out. Ouch. I've even got the bundled Allied PSU sitting on top of the case and it's not all that noticeable (. Thanks for the heads up for others on that side of the globe. I wonder how wide the area is with this alternate model, all a Google search turned up was some Australian sites, plus a Chinese or two (though pretty much always these are Chinese-made, so that would make sense). If it's truly just Australia and everyone else gets the Allied, then what's up with that? Yes thta does sound cool! I realize this was posted 6 months ago, but if you are still around, I would like more details of this mod (functionality added & how-to). Could you post them? Does that mod allow you to power the PC on/off with the IR remote? Might make the most sense to start a new thread -- but then please post link to it here, I will watch this thread so I can get notice if you post again. Thanks! Count me in on more info too, this sounds amazing.